These are the words of the late Rev. Dr. Anna Pauline “Pauli” Murray, a civil rights activist from Durham. On Sunday, Feb. 28, the Orange County Human Relations Commission recognized four Orange County residents who have carried on the legacy of Pauli Murray through their commitment to fostering true community in the 26th Annual Pauli Murray Human Relation Awards. The awards fell on the second to last day of Orange County’s Human Relations Month and the same day as the 88th Academy Awards. The Oscars have been widely criticized for lack of diversity, failing to nominate actors of color for the top four categories. “The Pauli Murray Awards were started as a way to honor people in Orange County who’ve worked for social justice and to give awards in the same fashion as the Motion Picture Academy gives awards for their own best actors and actresses,” said Gerald Ponder, the chair of the Human Relations Commission. Ponder said the awards are given annually to local heroes and heroines who fight every day for the underserved and underrepresented of Orange County. Susie Enoch, Human Relations Commission member and the master of ceremony, introduced this year’s four winners — two youth and two individuals — who were awarded for their exemplary commitment to social justice. 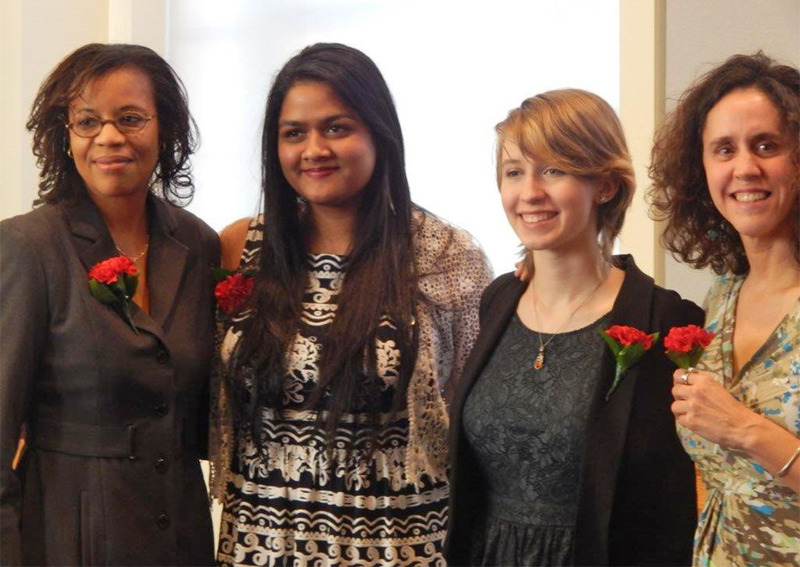 Ruth George and Linnea Van Manen, East Chapel Hill High School students, were the youth recipients of the Pauli Murray Award. They were honored for their work with marginalized communities, including refugee and LGBTQ students, Enoch said. Dr. Deborah Stroman, adjunct associate professor at UNC-Chapel Hill’s Kenan-Flagler Business School, was one of two individual recipients of the Pauli Murray Award. Stroman was recognized for her concerted efforts to improve race relations on UNC-CH’s campus, while relying on her faith, said Enoch. Stroman’s friend and co-worker Marco Barker said her faith has played an important role in her activism. Reyna Rivera, a social worker at Carrboro Elementary School, was the final individual recipient of the Pauli Murray award. Rivera was introduced by friend and co-worker Meridith McMonigle. McMonigle said Rivera created the community organizing and leadership development course, Mujeres Unidas y Activas, for Spanish-speaking mothers and revived the Radical Interventions for Student Equity (RISE), the African American parent leadership program. A native of Puerto Rico, Rivera said she lived a life dedicated to social justice abroad. She talked about her life in Mexico, where she participated in the Zapatista Movement and helped indigenous peoples and poor farmworkers fight for basic rights, including land ownership, education and peace. Rivera added that building true community and family through her work is so important because she was once orphaned. In her lifetime, Pauli Murray wore many hats. According to her biography on the Pauli Murray Project website, Murray was born on Nov. 20, 1910, in Baltimore, Maryland, into a life of hardship. Both of her parents died when she was a young girl. But, by the time of her death in 1985, Murray had become a distinguished civil rights activist, women’s rights activist, lawyer, author, poet, professor and priest. The website notes many of her accomplishments, which include becoming the first African-American female priest to be ordained by the Protestant Episcopal Church, founding the National Organization for Women (NOW), serving on President John F. Kennedy’s Commission on the Status of Women Committee, serving as the vice president of Benedict College in Columbia, S.C., among other things. “Pauli Murray was probably the most important figure of the Civil Rights Movement that you never knew,” Ponder said. “Almost no one knows about Pauli Murray, but she was an amazing woman. Murray’s legacy reaches wide and has deep roots in Orange County. Stephanie Davis, Murray’s cousin, attended the award’s ceremony and talked about the discovery of a hand-written land deed of Thomas and Sarah Fitzgerald, Murray’s maternal great-grandparents. Davis said Murray’s family has owned land in Orange County since buying their home and farmland on April 24, 1869. Davis and her family took a trip to the land where the Fitzgerald family farm was formerly located. According to her biography, Murray moved to Durham after the death of her mother in 1914 and was raised by aunt Pauline Fitzgerald Dame, after whom she was named. She received her high school diploma from Hillside High School in 1926. In 1938, she is sought admission to UNC-CH as a graduate student but was rejected because of her race. This rejection sparked an irrevocable and important lifetime’s pursuit of social justice and equity for Murray. She challenged UNC-CH’s segregationist policies, the first of many important campaigns for civil rights, and began a letter writing campaign against UNC-CH, her biography revealed. This campaign also marked the beginning of a lasting friendship with First Lady Eleanor Roosevelt. Even in her death, Murray’s legacy has continued. In 1987, two years after her death, her autobiography was published. By 2012, she had become a recognized saint. Since 1990, Orange County has awarded residents in her honor and, in 2007, her vibrant life has been immortalized in murals throughout Durham. Most recently, Patricia Bell-Scott published the book, “The Firebrand and the First Lady: Portrait of a Friendship: Pauli Murray, Eleanor Roosevelt, and the Struggle for Social Justice,” about their enduring friendship. The book was released on Feb. 2, 2016. Thanks to this book, Murray’s quiet legacy will be brought to the nation through film. Davis said filmmakers have contacted Murray’s family about the rights to make a movie. As Murray’s story prepares for the silver screen, members of the Commission talked about the Pauli Murray Award and its connection to the Academy Awards. 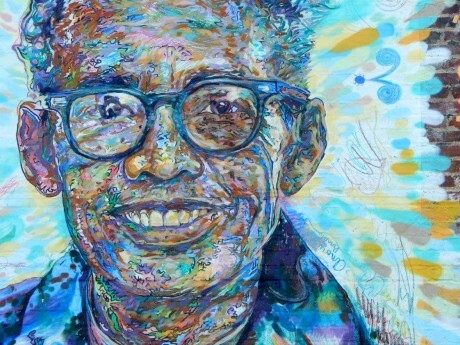 In 1990, the Orange County Human Relations Commission passed a resolution to create the Pauli Murray Human Rights Award. Twenty-six years and 55 awards later, Orange County continues to recognize residents who continue to live out Murray’s legacy. But the 26th award ceremony took an ironic turn as Ponder and Earl McKee, chair of the Orange County Board of County Commissioners, revealed the origins of the Pauli Murray Award. McKee said that the Pauli Murray Human Relations Award was actually inspired by the Academy Awards. The commission decided that the social justice award would be given Pauli Murray’s honor. The first Pauli Murray awards were given to Rev. Tim Kimrey, Ralph Pendergraph and Louise Echols. But this year’s Pauli Murray Award ceremony falls during an interesting time for the Academy. For the second year in a row, the Academy has not nominated any actors of color for the top four categories. This lack of diversity sparked boycotts of the Oscar Awards Ceremony and public reaction, including the hashtag #OscarsSoWhite. Despite being inspired by the Academy, the Human Relations Commission said they will continue to honor the diversity that exists in Orange County. “Today, we will see how actors and directors will respond to less than diverse Oscar awards,” McKee said. “At the same time, we will be honoring our local citizens for their work to foster a community that is not only diverse, but where our diverse community members have equal access to opportunities.